The same slow moving upper level storm system is still swirling over the desert southwest. This is the system that has given us days of severe weather, and a continued stormy pattern for this weekend. The center of that system is over Arizona at this time. It will be spinning moisture over Colorado throughout weekend. This will keep our storms scattered across the state. Although the threat for tornadoes, hail, and wind is lower than it has been, the threat for flooding is higher. 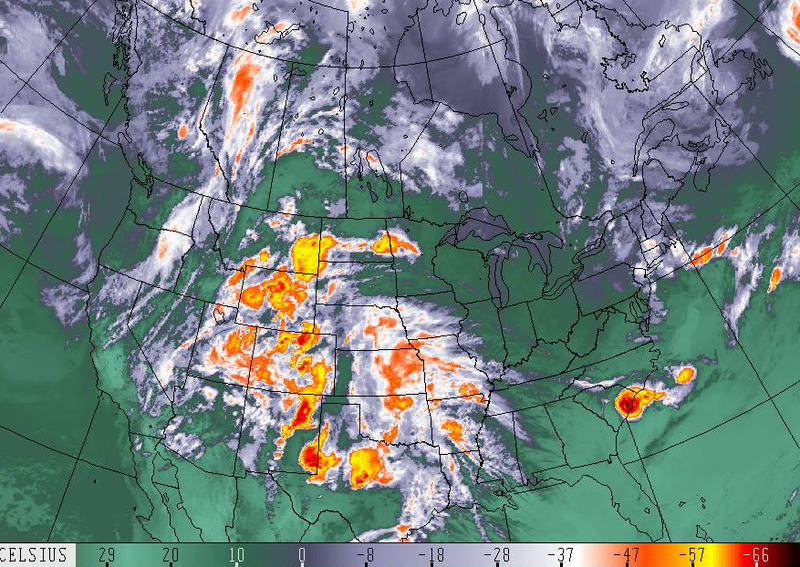 As of Friday evening there are a number of storms occurring across Colorado with incredible rainfall rates. These have sparked several Flash Flood Warnings that will continue into the 11pm hour. Some of the highest rainfall totals have been in the Loveland area, where dangerous flooding has been reported. Earlier this evening 1.61" of rain was reported near the outlets in Castle Rock. Downtown Denver didn't have as much rainfall (1.06"), but the intensity was such that some flooding was along the Cherry Creek and some buildings. These storms will subside past midnight, continuing the longest for those to the north near Larimer and Weld Counties. There is a flood advisory for sections of the Cache La Poudre due to rising water and action stage is expected near Greeley this weekend. Saturday kicks off the stormiest day of the holiday weekend. 50% chance for storms, with the same story being the flood potential. High temperatures will reach the 70s for the metro area. By Sunday, the center of our storm system will be moving from New Mexico into Texas. As it does so, it will be grabbing some drier air and a tad bit cooler air. This will turn rain into snow for some of the central mountains. That snow chance is mostly for Saturday night and Sunday morning. Only spottier rain/snow will be in the mountains later Sunday through Monday as the moisture moves east. For the Front Range and plains, the storm moving east will allow our rain chances to drop some, too...bit-by-bit. A 30% chance for storms Sunday with highs in the 70s. Finally, Memorial Day will be the driest of the weekend with only a 20% chance for a storm. Highs will be in the 70s to 80s. 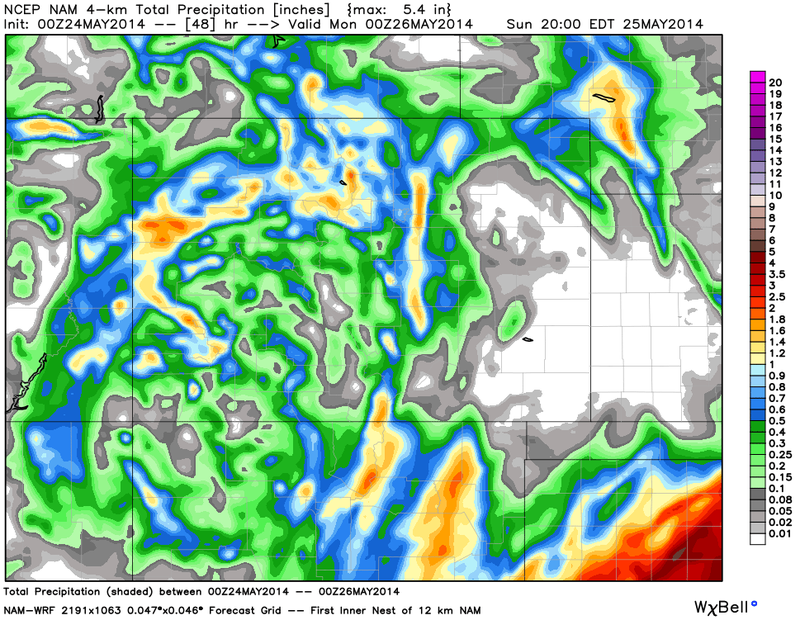 Here is a look at the 00z NAM precipitation totals through Sunday night for Colorado. It continues to project moderate totals in addition to what has already fallen this week along the Front Range which increases our flooding concern. Also of note, some of this precip over the higher terrain of central and southwestern Colorado will be in the form of snow! We will continue to monitor the latest flooding concerns through tonight, and track any flooding potential this weekend. As always, our most up-to-date information can be found on Twitter: @weather5280.